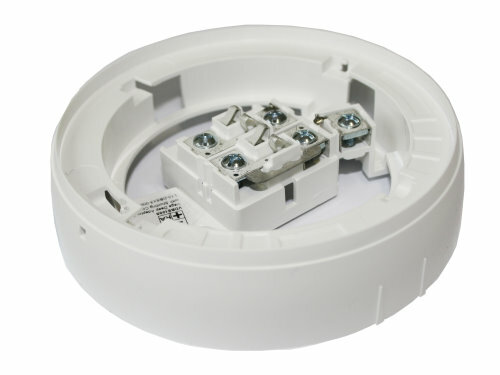 These deep adaptor bases are used to install Standard Vega and Vega Lite analogue-intelligent fire detectors on the ceiling's surface. This type of deep adaptor base is characterized by a shorting clip connecting the two negative terminals; this feature allows more flexibility when connecting Standard Vega or Vega Lite intelligent detectors to the loop, permitting the continuity of the loop cabling to be tested after installation and prior to the detector being fitted. The shorting clip must be removed with the VEGA detectors (for the work of the integrated isolator). - Shorting clip to test the loop. - The base does not provide line continuity during detector removal. - A useful terminal provides remote indicator output. - Accepts 2.5 sq mm cables. - Low insertion force for detector.